Ive played MC back in alpha. I don't play it as much anymore, over the last few years Ive just came back to it to play a run, and normally after that run I wouldnt play again for months until the urge came back. I was never a guy to play with mods back then, but whenever I played MC lately the game always felt too easy. In reality, I just got to familiar with how the game goes. In an effort to get some more value from the game I started playing adventure maps like Wayward Wonders. Definitely a great map. After I had fun with it, months later I get the urge to play MC again. I tried a few maps but nothing really compared to the fun in WW. I noticed from youtube that mob-mods can be a lot of fun, such as etholab's crash landing playthrough. I started off with "Special Mobs" that introduced some harder mobs to the game, but it wasn't a major improvement. Then I found this mod. Oh my god. When I first started MC, I was terrified of mobs. After playing for years I just understood every aspect of them and mobs became easy to deal with. This mod however reset my understanding. The feeling of seeing a skeleton in the distance firing arrows at you, closing the distance and arrows landing closer and closer, is A+ game design. Every sunset I did NOT mess around. Once the daylight first dimmed I dashed into my house. There were some times where I didnt keep track of time and almost got caught outside at night. Without the mod I wouldnt even be worrying about night time, but with this it was the same fear (and fun) I had when I first started playing MC. There were a ton of memorable moments from the playthrough I just did with the mod. Part of it was from not reading the "Current Features" on the mod page. Getting attacked by a bat was the most confusing thing! For endermen it was probably the scariest. I wasn't ready for the teleporting. In order to collect ender pearls, I had to build a long wall on a plain biome that let no mobs in, yet where I could still lure in endermen with sight and have a battle inside the walls. Thank you for guaranteeing a pearl to drop per endermen by the way. One time I ran into a dungeon with a zombie spawner, and a diamond armored zombie was one that emerged. I had all the zombies blocked off. I started to deal damage to the diamond one, but once I did I noticed he had a NAME! THE FLESH KING! That's when I noticed this was a boss mob you designed, and got screwed by baby zombies that spawned out of him. I eventually encountered another later in the game and got a nice sword from him. The nether was absolute hell. I couldn't figure out what made pigmen hostile (clever now that I check the mod page) And again baby zombies gave me problems! And I was really surprised to see ghast blow cobblestone up, and also 1-hit KO me when I thought I could survive a ghast ball passing over my shoulder. Blazes all over, but that made acquiring blaze rods easier since a nether fort wasnt necessary. I ended up finding one not too far away anyways. I stopped my playthrough at the end, only went in without items to see if anything was new. And all I noticed was that the dragon killed me quickly. Overall, best mod I played, maybe one of the best playthrough I had in years. Thanks! Hey Great mod i love it so far! I do have one error that pops in in console if you could help? Server thread/INFO [STDERR]: [lellson.roughMobs.events.SpiderEvents:getRandomRider:87]: The entity 'dmonsters.baby' is not a valid entity! It looks like you defined a rider entity in your config file, which doesn't seem to exist. Just remove the line (dmonsters.baby) or change it, if you wrote it wrong. Nope, sorry. 1.8 is dead for me and it would take a lot of work to backport the mod. Wanted to drop in and congratulate you on a well put together mod that really spices up the game without adding additional mobs and actually works really well with other mods such as Infernal Mobs and Baby Mobs. Oddly enough, it seems that the babies inherit these changes because that mod waits until the normal creature spawns and then replaces them. I guess it must carry over attributes of the mob replaced. I have encountered some issues however which would be worth correcting in an update. 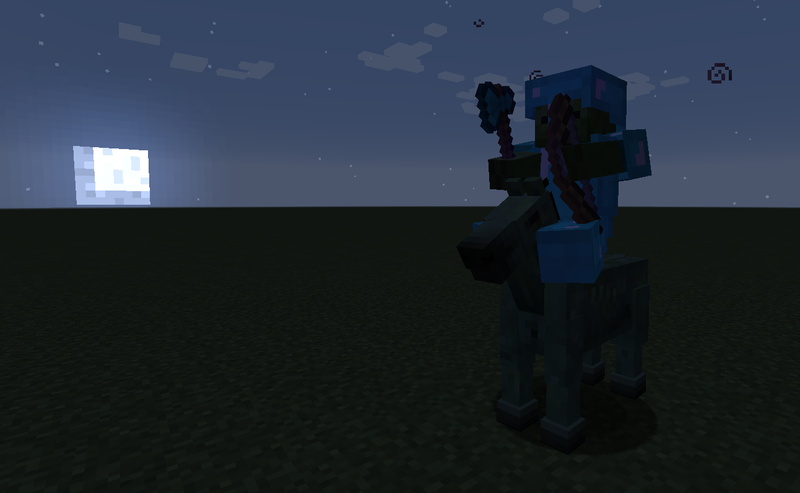 When mobs are set to attack passives they are also attacking skeleton horses and zombie horses that mobs are using as mounts. Not a huge problem but it does undermine the point of the mod when it removes these mounted versions. The reason I turned on the passive attacks is so that players need to protect their cattle in addition to themselves. Next, the zombie block breaking feature is also making the game easier as it is removing the ability for them to break down wooden doors. I've tested this several times and although they will try to run through closed doors they just don't break like in vanilla. I've also added these to the config file and although it is a 'transparent block' it appears that this part of your mod is broken. I also added glass but they don't break that either plus their AI ignores villagers and players who are inside of a glass cube. Other than these problems, everything else appears fantastic. What I would like to see added however is simple options like mob sunscreen to prevent them burning in daylight and the ability to configure mob spawning at different block light values rather than the default of <7. Lastly, and this is really just a nasty idea to make mobs even more annoying, would it be possible allow passive mobs to seek out and eat crops? It would seem like if the idea is to make mobs more of a problem them it would keep within the theme of the mod by allowing passives to have enhancements as well. Chickens flying over fences to eat wheat, rabbits digging their way into fields to eat veggies and cows knocking over fences to help themselves to your crops. The crops one is a great idea! All they need then is scarecrows to deter chickens (but not stop them entirely), we already have stone walls to handle cows but there should be no surefire way to stop rabbits from burrowing into fields. If there were ways to completely nullify the effect of passive mobs then it would remove the point of adding those features in the first place. Thanks! I'm very busy with work and other things at the moment, but I will definitely look into these errors as fast as I can. I've been (literally) looking for a nice and highly configurable mod to make Minecraft harder this whole day, and then, I found this mod! Also, any chance we can have rough Elder Guardians, Husks, Shulkers, Strays, Vexes and Ender Dragons in a future update? It would also be cool if we could have randomly and rarely spawning Killer Bunnies. And maybe Giants too?